Make pancakes and eggs for breakfast and fajitas for lunch with this Professional Flat Top Griddle. Covering two burners, it is large enough to cook for the hungriest of crowds. 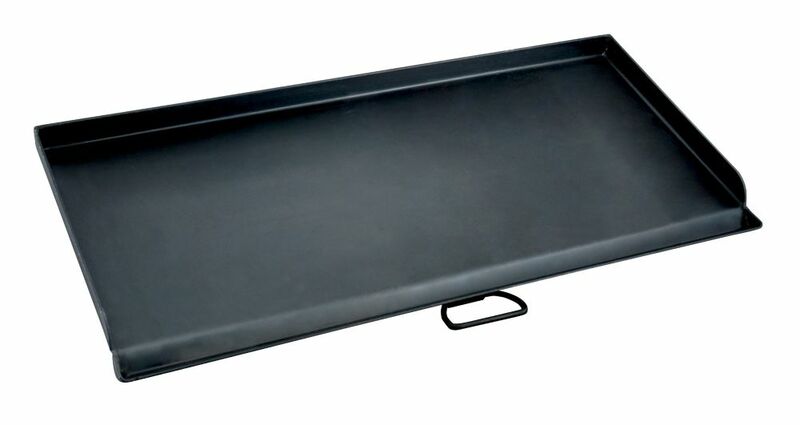 This griddle is built with Camp Chef's even heat design to minimize hot spots when cooking. Cooking and cleaning is easy because of its restaurant style high sides and convenient grease drain. Pre-Seasoned with a True Seasoned Finish, this griddle is ready to use out of the box and has a natural cooking surface. Combining some simple elements, the professional spatula set simplifies the experience of cooking outdoors. This set contains both a deluxe pancake flipper and a heavy duty turner/scraper. The beveled edges and long blades get under your food much easier than a standard spatula. Also, blades made from a flexible stainless steel greatly extends the lifetime of these cooking essentials. Features Flipper Rounded corners for easy flipping Long surface area for larger pancakes and eggs Flexible stainless steel design Large comfortable handle with hole for easy hanging Turner/Scraper Sturdy beveled edges perfect for scraping griddles Tapered edge for easy cutting directly on the griddle Durable stainless steel construction Large comfortable handle with hole for easy hanging Specifications Flipper Dimensions - 8" x 3"; Length incl. handle: 15.5" Turner/Scraper Dimensions - Blade: 5" x 3"; Length incl. handle: 12.5"
Caramelize onions, cook bacon, produce perfect potatoes, and so much more with the Reversible Griddle for the Rogue. 365 and 525 Series grills! Replace the cooking grids or just rest it on top, the durable cast iron does an incredible job at transferring heat, making it an ideal cooking surface. Just like our cast iron cooking grids, the Reversible Griddle has a porcelain enamel coating to increase longevity, and it even seasons up just like your favorite frying pan. The huge surface is great for making fried onions and mushrooms to accompany your main or create delicious meals to enjoy al fresco. Turn your grill into a breakfast station with the Reversible Griddle for the Rogue. 425 Series. Caramelize onions, cook bacon, produce perfect potatoes, and so much more! Get your sizzle on with this reversible griddle that can replace the cooking grids, or sit on top of them. The cast iron has a porcelain coating just like our cast iron cooking grids so it seasons up like your favorite cast iron frying pan. The huge 115/8 by 17>inch surface is great for making fried onions and mushrooms to accompany your main or create that delicious breakfast to enjoy al fresco. Professional Flat Top Griddle Make pancakes and eggs for breakfast and fajitas for lunch with this Professional Flat Top Griddle. Covering two burners, it is large enough to cook for the hungriest of crowds. This griddle is built with Camp Chef's even heat design to minimize hot spots when cooking. Cooking and cleaning is easy because of its restaurant style high sides and convenient grease drain. Pre-Seasoned with a True Seasoned Finish, this griddle is ready to use out of the box and has a natural cooking surface. Professional Flat Top Griddle is rated 4.9 out of 5 by 15. Rated 5 out of 5 by Little Drummer Boy from EXCELLENT Got this over a year ago and love it, it's my main cooking unit when camping. I cook just about everything on it and/or my Dutch Oven. I clean the griddle after every use and wipe it down with oil, it's also kept in its bag. As mentioned by another reviewer, the oil catch is not real good. However, CampChef offers another grease cup which works great with this griddle. Rated 4 out of 5 by Nick Name from Generally good, but needs better grease collector. Bracket for grease collector is flimsy. Need a more secure attachment method. Rated 5 out of 5 by Wildbill from Love Love Love this griddle! Awesome griddle! Heats evenly and easy to clean. I highly recommend! Rated 5 out of 5 by DJRKBR from Perfect griddle for my stove The griddle works perfectly with my Camp Chef stove. I had been trying to get by with griddles for small table top stoves like Coleman, but never got good results and obviously did not have the size that this griddle has. Cooks meat and pancakes and everything perfectly. Rated 5 out of 5 by kclilek from A quality made product! Our Boy Scout Troop has used Camp Chef 14" x 32" 2-burner stoves for 11 years now, but for some reason, past leadership purchased a couple unknown manufacturers flat-topped griddles, which are oddly shaped and poor fitting atop our stoves. I solved that recently by purchasing two (2) Professional Flat Top "60" Griddles for our matching 2-burner stoves! The griddles fit perfectly and helped us greatly in our recent annual pancake breakfast fundraiser! With safety being most important to us, no longer will be be using improperly fitting cooking equipment and these Camp Chef griddles are quality made, fit perfectly and will last us many, many years of Troop use! It is so nice to finally acquire these very fine accessories for our stoves and Camp Chef continues to be my go-to source for quality made outdoor camping/cooking equipment Thank you Camp Chef! Rated 5 out of 5 by Flame815 from Wow! Two of us own one. Weighs a ton but we'll worth the weight. Plenty of surface area. Bacon keeps it seasoned.